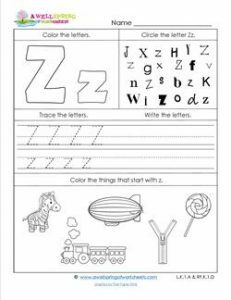 Here’s the last letter of our abc worksheets set – the letter z. Do your kids still need a little help tracing and writing the letter z? Or do they need more practicing identifying the letter z in array of other letters? Well, this worksheet will be a great skill builder for them. Added bonus – they can color, too. There are the big bubble letters (upper and lower case) and some objects that start with z that are waiting to be colored by your cute little munchkins.